Well here it is in a nutshell, we are closed, not because business has been bad but because God has called us to the mission field in Baja, Mexico to work at Rancho Sordo Mudo, a deaf school for children. It has been a great ride, our customers have been wonderful to work with and we consider you all friends ADIOS AMIGOS!!! Are you tired of asphalt roads and plastic bumpers? Need something better? Look no further! Baja Bumpers is what you need. 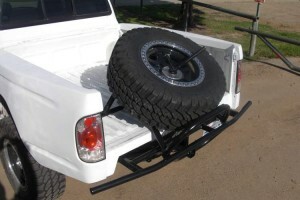 We fabricate tube bumpers, and other off-road accessories for trucks and SUVs. We make mostly bolt-on solutions, but also do custom fabrication. Baja Bumpers is a family owned and operated company that is dedicated to delivering a quality product at a fair price. We strive to bring you the most innovative bolt on products available, concentrating on both quality and ease of installation. Our family has been into fabrication, racing, and off-road activities for years. Baja Bumpers was founded to fabricate race quality parts for the enthusiast who wants bolt on equipment with the quality of a costlier “one off” fabricated part. 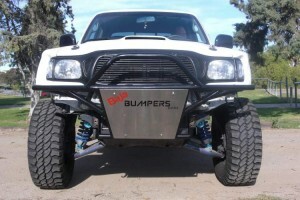 The front tube bumper will fit all 1995-2004 2×4, 4×4, Tacoma PreRunners or 4 Runners. This bumper is not just for looks, it is a fully functional off-road bumper meant to withstand the rigors of the true off-roader, and can be installed in under an hour with only hand tools (no cutting or welding required). The rear tube bumper will fit all 1995-2004 2×4, 4×4, Tacoma PreRunners. It is available with or without a receiver hitch, and also has an available removable spare tire carrier (the spare tire carrier requires drilling 2 – 1/2″ holes). As with all our products, this bumper is a fully functional off-road bumper meant to withstand the rigors of the true off-roader, and can be installed in under an hour with only hand tools (no cutting or welding required).